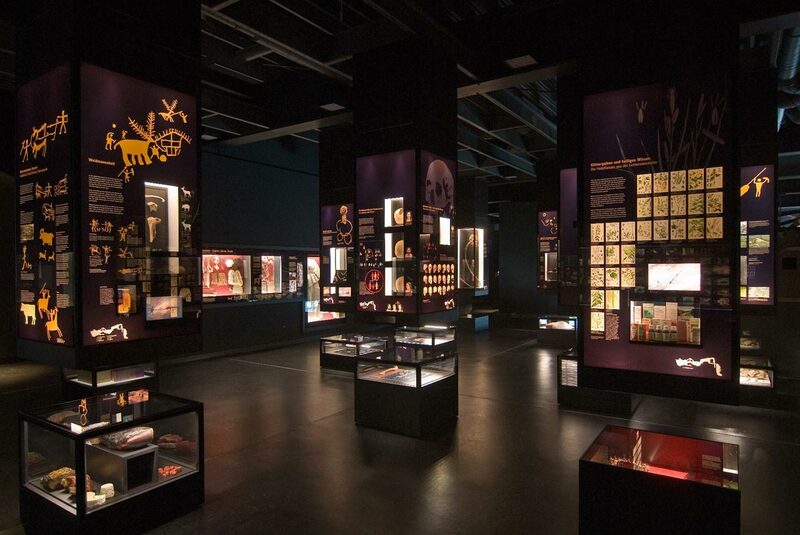 The museum above ground – architecturally a portal to the Earth’s interior – is dedicated to the sensational research results from the Lichtenstein Cave and the people who were buried there. Nearly 3000 years ago the cave, located near Osterode, was the burial site of a Bronze Age family clan. It is the first cave in Germany to be accurately reproduced – the walkable replica now hangs under the museum’s roof. In the burial cave, the DNA of up to 70 dead was preserved in an exceptionally good condition. This made it possible – for the first time ever – to reconstruct the family relationships of a prehistoric group of humans – a DNA analysis that attracted much attention worldwide. The manifold archaeological finds – bronze jewellery, beads, tools, vessels, plant remains, animal bones etc. – and the ancient DNA provided the basis for presenting the clan’s life and death as well as reconstructions of three members of the family and – also unique and spectacular – even living descendants of this family. In the museum, you will find the world’s oldest and longest family tree that has been genetically verified so far! Thanks to the reconstruction of the cave and to short films that bring rock carvings to life, not only adults but also children can experience the late Bronze Age in a vivid way. Free audio guides in English are available. Foreign-language guided tours of the museum can be booked.